Experimental observations have reported modulation of cortical oscillations as phases of high synchronization (waxing) followed by periods of reduced synchronization (waning) [1–3]. Although the phenomenon is present in almost all frequency bands, it is still not understood how this is driven. Here we study whether this phenomenon can occur in a network of inhibitory (I) and excitatory (E) cells and what effect external inputs have. Using NEURON, we model a network of N e excitatory and N i inhibitory cells such that N e /N i = 4. The cells have a single compartment, and include passive channels and voltage dependent Na+, K+ channels. Synaptic connections are random, projecting GABA synapses from I to I and I to E cells and AMPA synapses from E to E and E to I cells. To stimulate the network, each cell receives a baseline of current and a stream of spikes delivered at random intervals across the simulated period. We show that in a stable oscillatory network, waxing and waning occurs without the need for other synaptic mechanisms than the spike generating K+ and Na+ channels. The phenomenon can be modulated by changing the characteristics of the external input, such as number of spikes, mean inter-spike interval, randomness and whether E or I cells receive the external input. See figures 1 and 2. Raster plots of E (top) and I (middle) populations, during waxing and waning of a beta oscillation, and firing rate histograms (bottom). 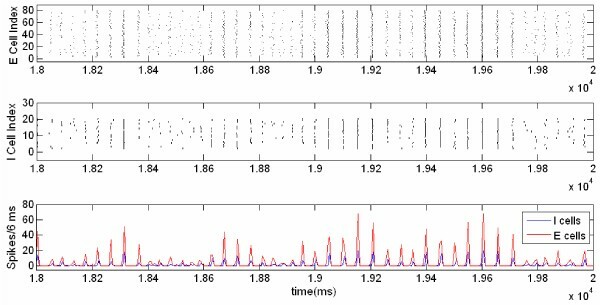 Wavelet transform of the activity in the E population for the same time period as shown in figure 1. The work was supported by the EU grant MC-RTN NEURoVERS-it (019247).